Vengeur Masque (left) is the rank outsider of trainer Mike Moroney’s two Caulfield Cup runners. 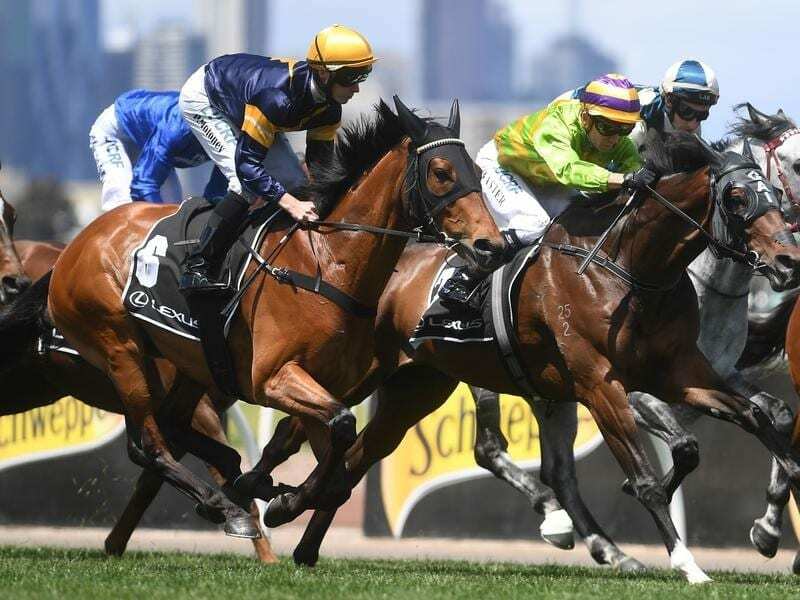 Bookmakers are dismissing Vengeur Masque’s Caulfield Cup chances but trainer Mike Moroney retains faith the gelding has what it takes to be a threat in the big staying handicaps. Moroney has two runners in Saturday’s $5 million Caulfield Cup (2400m) with German import Sound Check at $26 for his Australian debut and Vengeur Masque $126. Moroney says he leans Vengeur Masque’s way because he knows him better than the recently arrived import. “And I’m a Vengeur Masque fan,” Moroney said. “I just think on what I saw last year he’s very similar to (2000 Melbourne Cup winner) Brew, and he’s peaking now. After disappointing in The Bart Cummings last year, Vengeur Masque did not run in the Caulfield Cup but went on to win the Geelong Cup and Queen Elizabeth Stakes either side of a second in the Lexus Stakes, missing a Melbourne Cup start for the second consecutive year. Moroney said Vengeur Masque, a last-start fifth in The Bart Cummings, was as well as he could get him. “We’ve really been aiming to peak him for these two races, the Caulfield and Melbourne Cups,” he said. “And we’ve been planning this for a long time. “We only gave him two runs in the autumn, probably at distances he couldn’t win at, just to aim him here. So we’ve put a lot of eggs in the one basket. “Whether he’s good enough to beat the Europeans and a mare like Youngstar, I’m not really sure. Sound Check was bought with the major Australian staying races in mind after his last start in Germany where he ran second in a 2400m Group One race to Caulfield Cup topweight Best Solution. Moroney has only had Sound Check in his care in Australia for three weeks but says he is a lovely relaxed horse and believes he has the right staying credentials. “He seems to have settled in well and he brings really good form,” he said.